Most skiers can identify with a troublesome offside turn. The 2007 U.S. Open runner-up Thomas Moore says that keeping your shoulders level and your arms straight through the edge change makes it easier for the ski to travel out from underneath you into an arc instead of shooting out in front of you. Movements such as pulling your arms in off the second wake or dropping your inside shoulder put you on a narrow path and limit outbound trajectory, sacrificing width. So, instead of tensing up into your toeside turn, relax your arms and let the ski advance outbound off the second wake. If you don’t grip the handle the conventional way, you may want to switch it up. “You could instantly put yourself in a more balanced position on the ski,” says Cox. It’s a simple rule: With a baseball-bat grip, left-foot-forward skiers should have their right hand on top, and vice versa for right-foot-forward skiers. It may take a few passes to get comfortable, but soon after you’ll be much more symmetrical. Cox tells skiers making the grip change to hook in from the bottom of the handle on their offside turn. Watch men’s jump world-record holder Freddy Krueger prep for a set and you’ll quickly see why he dominates the ramp. Whether it’s a training session at his home lake in Winter Garden, Florida, or the final round of a major event, Krueger’s routine is the same. “If you want to perform your best, it’s important to have structure to your training,” says the world champion. He recommends monitoring your training sets to find the positive commonalities, both mental and technique-oriented, that can be repeated in future sets. He stresses that quality time on the water overrides quantity every time. Wade Cox says the majority of skiers that he coaches at 15 off, 30-32 mph are late on the gate. Often times the skier’s two-handed gate is slow and they end up riding flat. For many skiers, the one-handed gate is responsible for rapid progression in the course and often leads to elated fist pumps exiting the gates. You’re not going to overpower a 3,000-pound boat, so don’t fight its pull with your shoulders. Moore says some skiers block with their left shoulder on the pullout for their gate as well as their approach into the toeside turn. This causes them to get stuck on edge, resulting in down-course direction and inhibiting the ski from being released into the turn. 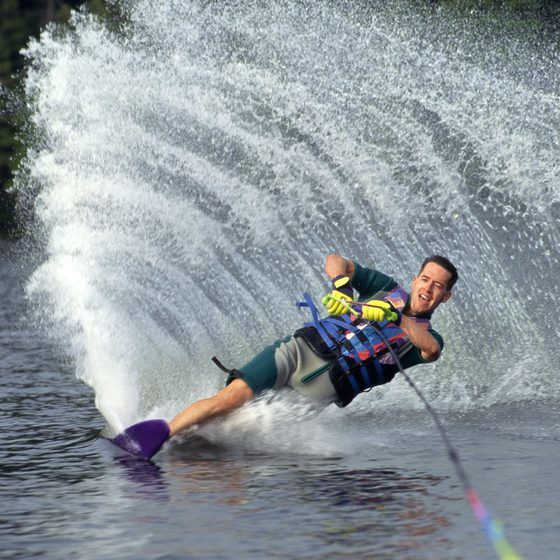 Let your hips move over the ski edge more smoothly while remaining square and balanced with the shoulders, and you can carry the ski out wider on the boat to apex sooner and have more time to turn. “As a left-foot-forward skier, I want my gate pullout to feel just like the backside of my 1, 3, 5 turn,” says T-Mo. A simple way of thinking about your slalom turns is dividing the course into two sides. From the centerline of the boat to the right of the wake (buoys 1, 3, 5) is one side, and to the left of the wake (buoys 2, 4, 6) is the second. Now imagine from the centerline (when you’re directly behind the boat) to the buoy and back to the centerline as one long, continuous turn. When Nowlan is at the apex of her turn, she uses her momentum to cast the ski out and carve all the way back to the centerline without being heavy on the rope. “Before the boat catches you, start turning in and meet the boat at the wake to give you a nice swing-out,” Nowlan says. Father of three boys, youth sports coach.